A shoulder separation is a common injury in contact and collision sports. 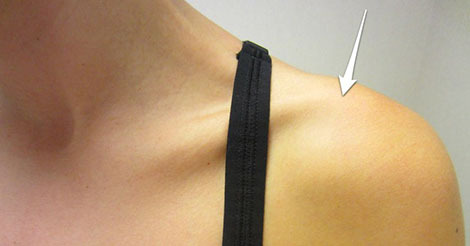 People often confuse shoulder separations with shoulder dislocations. In a shoulder dislocation, the ball pops out of the socket. When you suffer a separated shoulder, or AC injury, there is an injury to the joint between the tip of the shoulder blade and the collarbone. How do you suffer a separated shoulder? A shoulder separation, or more specifically an AC injury (acromioclavicular joint), occurs when the athlete receives a blow to the shoulder. There are many ways that this injury can occur, but they involve a force to the front or outside of the shoulder with the arm beside the body. Examples of this type of injury include a football player getting hit on the outside of the shoulder, a hockey player being driven into the boards and hitting his shoulder along the boards, or an athlete falling and landing on his shoulder with his arm by his side. An AC injury is very painful when it occurs. The athlete will usually complain of pain right at the point of injury, which is usually toward the front and side of the shoulder. Having said that, the pain may be fairly diffuse all over the shoulder and upper arm. The athlete may also complain of pain with any motion to the shoulder, and he or she may have weakness with certain activities because of the pain. Examination by a sports medicine physician is important. It is usually a simple diagnosis to make by physical exam. Often it is easy to see the separation, with the distal clavicle (end of the collarbone) noticeably higher than the acromion (tip of the shoulder blade). The patient will usually have very specific point tenderness at the junction between the acromion and the distal clavicle. Having the athlete reach across the body, such as touching the opposite shoulder, will reproduce the pain. X-rays are usually taken to determine the severity of the injury. They will reveal one of six different types of AC separations. It is beyond the scope of this post to explain fully the different types of AC separations. What is important to emphasize is that mild forms of AC separations can usually be treated without surgery, and the more severe injuries almost always require surgery. Fortunately, AC separations that occur in sports rarely need surgery. There usually aren’t any long-term complications of this injury, although it is felt that some of the mild shoulder separations are at risk for degenerative arthritis at the AC joint years down the road. Most shoulder separations are treated initially by placing the athlete in a sling to help decrease the pain. I usually have patients start shoulder range of motion and rotator cuff strengthening exercises almost immediately. At first these exercises may be difficult due to the pain, but I have found that starting motion and strengthening exercises with a physical therapist right away can decrease the duration of the pain and make return to sports quicker. Usually it takes an athlete between 1 to 4 weeks, in my experience, to get back into sports depending on the severity of the injury. Severe shoulder separation surgical options. 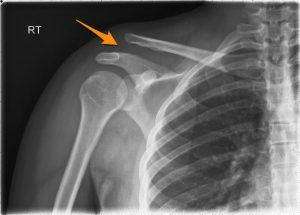 Notice the vertical separation (orange arrow) between the tip of the acromion and end of the clavicle in this more serious AC separation.